What problem does your business solve: We interview chefs, influencers, food/beverage purveyors, and other leaders in the food/beverage industry to push past what is covered in traditional media outlets. Our Bvster tribe is made up of people who want to start a food/beverage small business, currently work in the industry, or simply love food and want to be more informed about local food/beverage companies. We create content that provides our listeners with a realistic picture of what it takes to run a successful small business from mouths of the people living and breathing it. We also strive to tell compelling stories that highlight how food/beverage entrepreneurs are also creatives and community-builders. What makes your business unique: We approach food media from a different angle. William and I are both genuine and approachable people so it was important that this was a core part of the Bvster brand as well. Our goal is to make every member of our Bvster tribe feel like they are right there with us drinking a beer while we chat with our guest(s) on the podcast. So we always start out with a casual conversation between William and me related to the content we intend to cover. We’ve talked about everything from meat to bun ratios on burgers to my experience eating a seahorse in Beijing. We are also a mobile podcast. This means we don’t record in a studio and most times are chatting with our guests at their location. So yes, you’ll hear dishes clanking or doors opening, but it adds a layer of authenticity you won’t find in many other food podcasts. What’s your story: Bvster originated in a Starbucks in Secaucus. William found himself there contemplating where to go next in his career and whether to continue pursuing his passion for craft beer. As the only customer in Starbucks, when he heard the barista call out “Latte for Buster!”, he realized they were referring to him. At that moment, he took a leap and decided to buy the domain name Buster. However, it was taken so he chose Bvster. Three months after Bvster’s inception, I met William at a freelancer’s union meet up. We shared many common goals and interests (beer, showcasing local communities, and a love for storytelling to start). Shortly after, we bumped into each other again at a local food conference, TechMunch. The conference focused on the future of food social media, especially podcasts, which inspired us to pursue creating a podcast together. We realized that between my analytical background and experience as a writer combined with William’s technical knowledge and network of connections from his photography career, we formed the perfect team. One piece of advice you have for other food entrepreneurs: Read Simon Sinek’s “Start With Why” and know why you want to be a food entrepreneur. It is essential to have a deeper reason for starting a business that your audience can identify with on an emotional level. Knowing your why allows you to identify a problem you can solve for your audience and create a concept to solve that problem. What do you wish you had known before you started your business: How successful wearing matching plaid shirts as a brand strategy would be. It started out as a joke because whenever William and I met up, we both often wore plaid shirts. 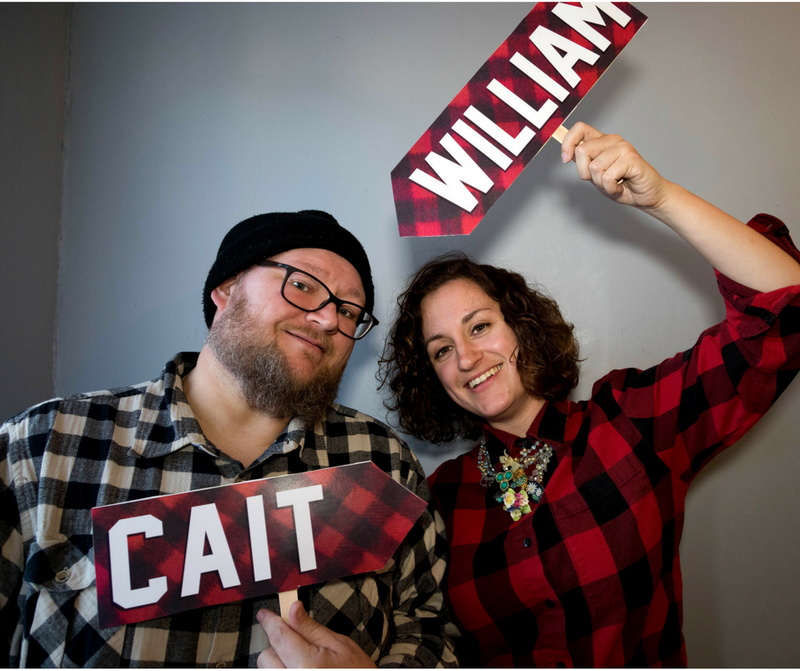 So I mentioned to William about intentionally wearing matching plaid shirts to events/interviews as a way to brand ourselves. We’ve had so many people approach us because of the shirts, even on the street. It’s an instant conversation starter and people remember us because of the shirts. What’s your greatest challenge in your business and how are you overcoming it: Getting both of us in the same place at the same time! I live in Brooklyn and have a full time day job, while William lives in Jersey City as a freelancer. Oftentimes businesses we want to feature on the podcast can only meet during the day, which means I can’t physically be there. Oftentimes I will be on the phone with Will listening and adding follow up questions while Will records the live podcast. We pre-record me asking the questions in the advance so each podcast is consistent. William and I are also in constant communication, which helps to bridge the gap. I joked with William recently that if I haven’t received a text from him in the last hour regarding a new idea, a new contact he made or update regarding the podcast, something is seriously wrong. We even Skyped while I was in jungles of Colombia about upcoming podcasts and our to-do list. It really helps that William and I work really well together and are able to effectively communicate with one and other. We both respect each other’s strengths and trust each other to take the reins and put our egos aside. For example, William is great making connections with people, whether it’s for the podcast or to expand our network and he also does all of the editing for the podcast. I trust his process and let him do his thing without micromanaging or questioning his methods which allows me to focus on other aspects of the brand. What are you most proud of about your business: The quality of the content that we create. I take the time to thoroughly research each guest we want to feature and craft questions to tell a different version of their story. This shows in the podcast as our guests respond with insightful, informative and thought-provoking answers. The content on Bvster bridges the delicate gap between providing useful information about how to start a business without getting so technical that we lose our listeners that simply have an appreciation for restaurants/breweries and want to hear the stories they have to tell. What do you love most about being a food entrepreneur? The connections and relationships we make along the way. We get to grab a beer and a bite with some of the hardest working and passionate people all while chatting about mine and William and favorite topics-food and beverage. Everyone we work with becomes a part of the Bvster tribe. We love that we are able to give these small business exposure through our platform to tell their stories. And the stories they tell inspire other Bvsters to start their own business. So it’s this amazing cycle of sharing, learning and growing that we get to create. And we do it all while eating and drinking;, you can’t ask for a better job.